1 Gang 13A Switched Socket. Decorative Screwed Flat Plate. Stainless Steel with Grey Inserts. FULL MATCHING RANGE IN STOCK, FULL RANGE OF FINISHES. 1 Gang Double Pole 13 Amp Switched Socket Outlet. White Moulded Accessories. 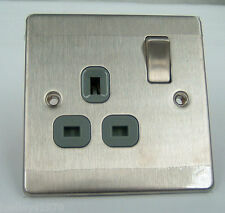 Stainless steel 13A One gang Switched socket. Double pole. This does not effect your statutory rights. Collections from our trade counters is possible. 13 Amp 1 Gang Single Pole Switched Socket Outlet. Screw covers. Ultra Slim - 1.5mm Solid Stainless Steel Face Plate. Foam gasket protects the plate. The reason we ask for your compliance is to ensure our dispatch facility which sends out thousands of parcels every week runs as efficiently as possible. Tactile curved rocker switches with a positive switching action. Colour co-ordinated rocker switches. Ultra Slim - 1.5mm Solid Stainless Steel Face Plate. Distinctive Modern Design. Foam gasket protects the plate. Double Pole. All our reconditioned products may vary slightly and this is also reflected in the pricing. Most of our products have been opened to check that the item is complete and in working order. Nexus Storm Ip66 1 Gang 2 Way Sp Switch. Robust, high impact UV stable housing. Ergonomic design. Manufactured to BS EN 60669-1. Add to your Favourites. FORCE MAJEURE. We will not process unpaid orders. Product: Single / 1 Gang Round Pin Socket 15A. Standards: BS 546. BS 546 is also the precursor of current Indian and South African plug standards. 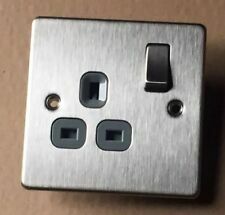 This type is commonly used in the UK for indoor dimmable theatre and architectural lighting installations as fused plugs are not convenient if the plugs and sockets are in hard to access locations (like lighting bars) or if using chains of extension leads. MK K2958PCR - CHROMA SWITCHED SOCKET - 1 GANG. • Rated at 13A. • Maintains it's attractive appearance for many years. • Supplied with fixing screws. • Live and neutral connections are shuttered for extra safety. Single switched plug socket. Victorian Brass. Victorian style with chamfered edges. Finish: Polished Brass. Single Switch. Inserts: Black. Single Switched 15A Socket - Grey Insert. Screwless low profile design with built in gasket. 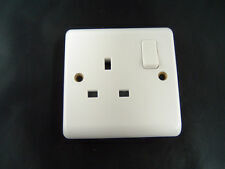 13A 1G Switched Socket. Height 87.5 mm; Width / Depth 87.5 mm. Minimum mounting box depth 25mm. 1 x Recessed Socket, Has 1x 13A Socket and 2x USB Sockets (5V 2.4A). Recessed - Requires 112mm Cut-Out with mounting board thickness of 14-50mm. Drop down cover (Not spring Loaded) Sits flat when not in use. Rope edged Georgian pattern. weight 200gms. approx size 87 x 87mm. 13 AMP SINGLE SWITCHED SOCKET WITH SINGLE USB SOCKET OUTLET. 1 X 5V 2400mA USB OUTLET. MIRROR POLISHED STAINLESS STEEL. We will always go out of our way to source the product you are looking for. POLISHED STEEL. 13A Single Switched Socket and 13A Single Switched Socket WHITE Indicator's Complete with fixing screws. This product is manufactured to the highest quality. 13 Amp 1 Gang Double Pole Switched Socket Outlet. Screw covers.